When you visit your local Four Roses retailers, be sure to keep an eye out for the new package design of Four Roses Bourbon. In January 2018, we announced the launch of a new bottle design for Four Roses Bourbon, our namesake Bourbon offering. Cases are hitting retail locations soon, so be sure to look out for the updated bottles. 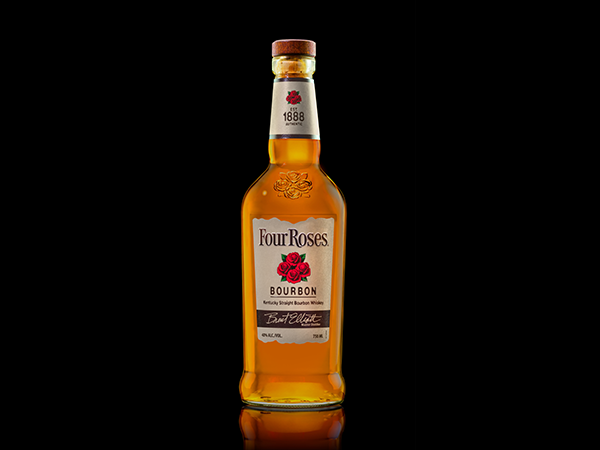 The renewed packaging was designed to maintain consistency, in color and style, with our other signature products – Four Roses Small Batch and Four Roses Single Barrel. The upgraded Four Roses Bourbon packaging features a wood top and cork finish, as well as all new labels, giving it a more premium look. Of course, the iconic rose cluster is prominently featured both on the label as well as embossed in the glass. Check your local Four Roses retail location soon for bottles of Four Roses Bourbon with its new, redesigned packaging.